She told me about this brand new tiny company she was starting up together with Agustin Cuenca and some other folks I didn’t know by then, and who resulted to be brilliant. The idea was to be an Application Server Provider and offer products in the later so-called cloud to help small and medium size companies manage their businesses. They would also develop web applications for third parties. And they would do it all using this new toy called Rails, after a successful proof of concept for a real client by Xavier Noria. Regarding project management, they didn’t want to use a traditional approach, but going down the Agile road and use Scrum. The name of the company was ASPgems, where ASP stands for Application Server Provider and “gems” was something related to this Rails thing. I was very reluctant to join them. Apart from having just landed into a great job position, I had a lot of doubts about the new company. 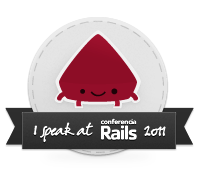 They didn’t have any money, so I would have to cut down my salary and trust the company would eventually make it; they were working remotely, so I thought nothing would get really done; they didn’t have any big clients, and I came from the banking/public sector/corporate world; and to top it all they were using this Ruby on Rails framework and these requirementless agile methodologies. My first experience with Ruby, some years before, was painful. I had to make some kind of automatic web crawler and I found libraries for doing it both with Ruby and Jython. I didn’t knew any of them so I tried them both. Right now I don’t remember why I didn’t choose the Jython library, but I know why I didn’t choose Ruby. After half a day trying, it was impossible to make the thing work on my windows machine, and all the documentation was in Japanese, so good luck with it. I finally coded my own crawling solution in good old Java and XML. So you can imagine I was skeptical about Ruby. Then I started to read about Ruby and Rails and I panicked: no static type check, lack of hosting options, poor windows support, opinionated instead of configurable, with a certain disdain for the database layer… my Java instincts were alerting me with a lot of red signals. And then I made “the mistake” of having lunch with Ana and Agustin. They were really excited about the company, they saw a world full of possibilities, and the sense of adventure was just too strong for me to resist. Besides Agustin had been the guy who started Qarana, the best company I had worked for until then. It was just natural for me to join ASPgems. By adopting Rails as her development framework, ASPgems was making a statement: We don’t care what other people are doing, we want to use the best tools available with or without the support of the rest of the industry. Living up to that statement takes a lot of work. First you have to be sure you are using the best tools available, so you have to be scanning the surroundings all the time to see when it’s time to move to the new best thing. Besides, you have to keep up to date on all the changes and on the new libraries available. And of course in many occasions you will have to be the one building those libraries, because getting there first means no one did the work for you yet. This living on the edge thing can be really time consuming, but things get much easier when you find a friendly community sharing your passion. And in Ruby/Rails we are really lucky on that issue. Today is ASPgems’ fourth birthday and I’ve been a part of the company almost from the first month. If I have to judge in terms of personal development, I can say without any doubts this is the best company I’ve worked for, and I guess that’s why I’ve stayed here longer than in any other place before. Below are some of the things I have done in the last four years. Had I stayed in my safe Java corporate world, I’m not sure I wouldn’t have done some of these things, but I’m sure ASPgems inspired me to do most of them. ..attended more conferences (and camps, and other events) in the last four years than in the previous 10+ since I started working on IT. Happy birthday ASPgems, and thank you. p.s. By the way, remember how skeptical I was about Ruby? I was wrong, and happy to be. Go try it by yourself!